Oh, you got to sleep in a nice warm bed during the Rolex 24? That's nice. When did your car break? In overnight endurance races, if your team isn't awkwardly passing out in the paddock, there's a good chance that you've already lost. Here's our mega-gallery of folks who couldn't make it back to an RV. The wise among the teams' staff brought blankets and chairs so as not to pass out on the ground, cold and in the way. That's not to say that they always remembered to take their helmets off, though. Nope. When sleep calls, you answer. Some teams banished their snoozers to the walkway behind all of the pit stalls. Certain places made it harder to tell if you were sleeping on the job, such as these elevated stations with monitors galore. Are you nose-down to crunch some numbers or having a nap? We can't really tell from this angle. Even then, some people still couldn't keep their heads up and passed out wherever they were. Some drowsy mechanics were better at holding their head upright than others. This one had the added benefit of mirrored lenses to hide his drooping eyelids from the general public. "They call me Out. Passed Out." Sometimes, whole crews would be asleep at once. If it's 5:00 a.m. and the car is running fine, why not let everyone have a break? Packing blankets also doubled as human blankets in the cold wee hours of the morning. It's not surprising to see people passed out in full racing gear. Sure, falling asleep with a helmet on is a special feat, but let's be honest, firesuits feel like big onesies for grown-ups, anyway. There's no shame in passing out in those. Sleeping in chairs was certainly a common theme. Even though racing by default is a dirty activity, falling asleep out of a critical path is key. Tall chairs, short chairs, wide chairs, high chairs: it doesn't matter when you've been up for fifteen straight hours of racing. Every chair is a sleeping chair at the Rolex 24. Not every public snoozer was affiliated with a team. The Media Center became a sleeping hut after hours as well. It was heated, making it an attractive place to nap if you had no qualms about passing out in a building full of people who tend to keep markers on them. This one claimed that my camera woke him up. Oops. We weren't the only ones who came across sleeping beauties in the paddock. 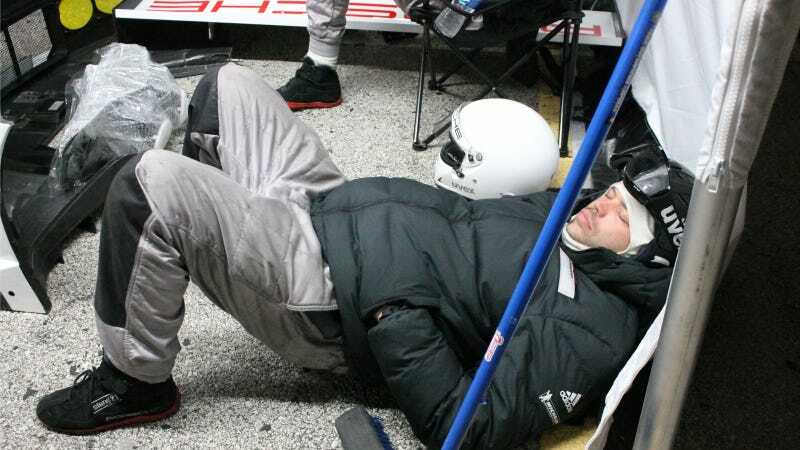 Even the TUDOR United SportsCar series was tweeting pictures of the ever-present dozing crew. Busted by the sanctioning body. Haha. Turner Motorsport was particularly willing to post their own crew napping at work. They also know what I'm talking about with the sharpies. I hid to take my nap. This is why. Many drivers and teams had RVs in the paddock much like Jordan Taylor's Haus of Snooze, but when a chair is right there alongside the constant, relaxing hum of a day-long race, that chair is the place to sleep. Turner had a selection of very comfortable chairs, it seems. Even behind the main pit stall lane, folks were eager to get a short nap in. Dempsey/Wright Motorsports' well-sealed pit stall tent apparently made for a comfortable napping spot. Flying Lizard had no shame about sending their crew members out into the sun for a quick morning nap. Using a large tank as a pillow is pure genius. Overall, though, this Porsche team member who fell asleep in the middle of his pit stall tent's floor definitely takes the cake. You, sir, are King of Motorsports Napping at the Rolex 24. May tired eyes everywhere stew in jealousy of your mad dozing skills.